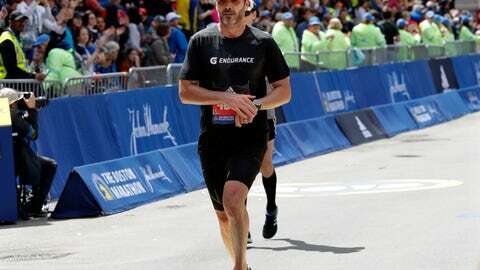 BOSTON (AP) — Seven-time NASCAR champion Jimmie Johnson didn’t have many problems on the Boston Marathon course Monday, finishing in 3 hours, 9 minutes, 7 seconds. It was only after receiving his medal from 2014 winner Meb Keflezighi that Johnson ran into a road block: On his way to a postrace media availability, security wouldn’t let him through. Unlike at a NASCAR race, when the fans are split among 40 different drivers, Johnson felt like the spectators lining the 26.2-mile course from Hopkinton to Boston’s Copley Square were cheering for everyone. Other runners also recognized him and offered pointers. Still, it’s the fastest Boston Marathon ever run by a Daytona 500 winner. Johnson received his finisher’s medal from 2014 winner Meb Keflezighi, a fellow Gatorade athlete who also left a signed copy of his book waiting for the driver in his hotel room. Special enough to earn it a spot of honor back home. The marathon medal is going in his office, where he keeps a Daytona 500 trophy, one from the Brickyard 400 and a NASCAR championship trophy. Johnson has had a connection to the race since 2013, when MIT police officer Sean Collier died in the pursuit of the Boston Marathon bombers. Andrew Collier, Sean’s brother, was a machinist in the engine department for Johnson’s team.